•Using blank-presentation is the most flexible for you! •"AutoContent Wizard" walks you through a series of questions about your presentation, letting you choose from a variety of predetermined content themes, visual styles, and formatting options. You can answer all of the questions or skip some and click "Finish" at any time. •"Design Template" allows you to choose from various background designs and slide styles to use throughout your presentation. Clicking the various presentation options shows thumbnail views of their designs. Click "OK" to choose one. •"Blank Presentation" starts you out with blank slides. 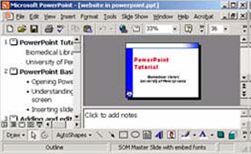 In the Normal view, the screen is split into three sections showing the presentation outline on the left, the slide in the main window, and notes at the bottom. •Learn how to resize text boxes and reformat text. •Some image-editing (like cropping) can be done with powerpoint.